If you think you have bed bugs, don't panic. Call 540-470-0175 for a free inspection. Brown Exterminating can eliminate bed bugs. Note: If you decide to treat bed bugs yourself, please read the label of the product you are using. Many times we find individuals using products improperly or in a harmful manner. Bed bugs in Virginia are a serious problem that require professional pest control. Accounts of bed bugs are on the rise and you can bring them home from motel rooms to purchasing or renting used furniture. They do not care what social class you are in or how clean your house is, they only care to feed and grow in population. You may disregard bites or even a sighting, but eventually they will grow in number that cannot be ignored and something will need to be done to insure the bed bugs are completely eradicated in your house. Do not wait to call, the inspection is free, 540-470-0175. 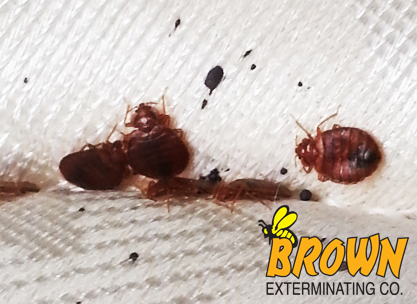 Contact Brown Exterminating and our bed bug experts will discuss with you every step of the process, from a complete inspection and positive identification to the process of eradication. And, since our treatments are safe and effective, your home will remain safe for both kids and pets once treated. Brown Exterminating is a full service pest control company with over 40 years experience and services Waynesboro, Fishersville, Staunton, Harrisonburg, Lexington, and surrounding areas. Call today and we can start the process of killing bed bugs and getting your house back in order. Integrated pest management strategy, includes preliminary instruction. Bed bugs? More than you may want to know. Although they're called bed bugs, they can be found nearly anywhere people are found. A couple can tag along from a motel room or in a piece of second hand furniture and you adopt a bedbug problem. They are annoying, hard to kill, and can survive for over a year without feeding in clutter, behind baseboards, in carpeting, sofas and other furniture. At night they come out to dine on blood by following carbon dioxide from your breath, not a pleasant problem to have. If you ever wake up with itchy or bruised skin, you may have a bedbug problem without even knowing it. Fortunately, a bedbug problem is entirely controllable under professional care. Using state-of the art equipment and techniques, Brown's licensed exterminators will inspect your home's environment and construction to identify the problem and determine the best course of action. Most bedbug infestations can be eliminated with the use of low odor but very effective organic pesticides using methods that are safe. We are committed to providing a quick and most importantly, effective solution to your pest problem, and we take every measure to protect your and your family's safety throughout the process. So whether you suspect you have a bed bug problem or just want to make sure you never get one, we have the expertise and training to get rid of your unwanted house guests, for good. For more information or to schedule a free inspection and consultation, please contact us today. Female bed bugs can lay up to five eggs a day and 500 during a lifetime, so call today, before your small problem becomes a big one. Cimex lectularius (common bed bug) prefers to feed on human blood although other species of Cimex are adapted to other animals such as bats (Cimex pipistrelli (Europe), Cimex pilosellus (western U.S.) and Cimex adjunctus (which is found striving on the entire eastern US). Bed bugs are parasitic insects that feed exclusively on blood. "Bed bug" as a street name has been used as the insects primary habitat is a warm climate and preferred nearby or in beds, bedding or other areas where people sleep. Bed bugs are mainly nocturnal (active at night), but are known to be active anytime of the day especially when an opportunity to feed is available. They have the ability to feed without detection. Remember: Bed bugs are excellent travelers and easily hide in suitcases, boxes and shoes to be transported to a food supply. Bed bugs (Cimex lectularius) is thought to have originated in the in the Middle East in caves inhabited by bats and humans giving rise to bed bug infestations in various other human habitat. Bed bug life cycle: Egg, Nymph and Adult living in a mattress. For Thousands of years bed bugs have been a known human parasite. In the early 1940s, they were mostly eradicated in the developed world, but have increased in areas all over the world in recent history. Bed bugs were mentioned in ancient Greece as early as 400 BC, and were later mentioned by Aristotle. Pliny's Natural History (first published circa 77 AD in Rome) claimed medicinal uses for bed bugs and were commonly thought to be able treat snake bites and ear infections. Medicinal uses for bed bugs continued until sometime in the 18th century. Germany first mentions bed bugs in the 11th century. France first records bed bugs in the 13th century. England first reports bed bugs in 1583 though bed bugs remained rare until sometime in 1670. Once infestations grew as well as world travel and commerce, bed bugs traveled the high seas to the rest of the world. In the mid-19th century, smoke from burning peat was recommended as an indoor fumigant against bed bugs. The increase in bed bug populations and infestation in human habitat in the 20th century has been attributed to the invention and use of electric heating. 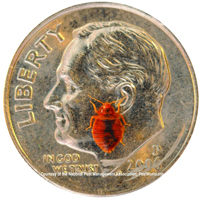 This allowed bed bugs to thrive year-round instead, not just in warm months. U.S. military bases during World War II had serious issues with bed bugs. The treatment used in the 1940's was to use cyanide and later DDT, both extremely dangerous compounds. The availability and use of modern pesticides had had an effect on decreasing bed bug populations as well as public awareness and slum clearance programs. Bed bug infestations have been on the rise since the 1980s as insects have the ability to become resistant to some of the modern pesticide most widely used in killing them and the enormous increase in international travel. Statistics from The U.S. National Pest Management Association reported a 71% increase in bed bug infestations between 2000 and 2005. The number of reported incidents in New York City increased from 500 in 2004 to 10,000 in 2009 alone. A recent theory for the dramatic increase in bed bug populations is that they have been forced to survive on other hosts besides humans and have adapted to survive on chickens as bed bugs have been reported at poultry facilities in Arkansas. 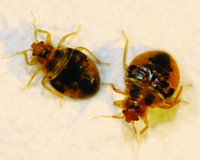 Workers are possibly spreading bed bugs inadvertently to their homes. Bed bugs are annoying and embarrassing as your home can be clean and still harbor them. Bed bugs do not care if you live in a nice neighborhood or what you do for a living and can effect anybody who happens to cross paths with them. Bed bugs like to hide in small cracks and crevices in warm areas close to humans, for the most part. Bed bugs are commonly found in bed parts (mattresses, box springs and folded or creased areas). Bed bugs are also fine with hiding behind baseboards, wallpaper, upholstery, picture frames, electrical switch plates, and in furniture or fabric creases and crevices. Beg bugs can also survive in temporary habitats, such as suitcases, backpacks and under the seats in cars, buses and trains. Public transportation can easily spread bed bugs to many hosts once they are there and waiting to feed. Since a bed bugs habitat is only exclusive to being warm and near a food source they have been found nearly everywhere. Reports of infestations include office buildings, movie theaters, retail stores, clothing stores, college campuses and even 5 star hotels. Pretty much wherever people are present and moving about. A mature bed bug can lay 5 eggs a day, every day (500 over its lifetime). Once the eggs hatch a bed bug will feed and molt five times before becoming an adult. Once an adult each bed bug will follow the same cycle, each taking about 2 months to mature and begin laying eggs. A mature bed bug will live about 9 months. If an adult bed bug, in a good environment, laid 5 eggs every day for 4 months. It can be concluded due to the life cycle of this insect that you could be harboring many thousands of bed bugs in the area of infestation. Bed bugs are only active at night. Bed bugs can be active and bite any time of the day. Dirty homes are the only ones with bed bugs. Bed bugs can be in any kind of home. Bed bugs only live in beds. They are found in beds, couches, chairs. Anywhere a bed bug can hide and feed. Bed bugs can fly from room to room. Bed bugs can not fly and do not even have wings and they cannot hop. not get rid of bed bugs. Bed bugs only live in big cities in specific areas. Bed bugs have no geographic boundaries as long as the conditions are good for them to exist. Brown Exterminating will send and experienced and licensed inspector to thoroughly inspect and identify the bed bugs if in fact bed bugs is what you have. We have encountered a couple of requests for inspection due to the recent bed bug uprising that resulted in finding carpet beetles or other similar pests but no bed bugs. We treated the pest problem as identified and everybody was happy. Proper identification of an insect is extremely important to be able to properly target and eradicate them. Do not wait until the issue is unbearable and call Brown today for a free inspection and quote.